On Saturday the 15th of September we started our journey with a 6,5 hour bus tour to Rostock. In Rostock we had enough time to explore the city because our ferry to Trelleborg (Sweden) took off at midnight. On the ferry we went to bed very soon because we were all tired because of the long trip. The next day after breakfast at 6.30 am we started the next part of our trip by bus to Stockholm (Sweden). We also wanted to explore Stockholm but there wasn`t enough time because our ferry to Turku (Finland) took off at 8 pm and we just arrived at 18.30 pm. The last part of our trip to Valkeakoski took us another three hours. So we arrived at our campsite on Monday morning at 11 am. At the campsite we have cottages for 6 people each. They all have their own sauna and most of them have a nice view over the lake. On the first evening the Finish students came to our campsite and we had a nice BBQ and the chance to get a first impression of each other. Very early on Tuesday morning at 7.30 am we had to wake up and prepare for our first day at school. When we arrived at school at 9 am we first got to know a lot about the Finnish school system and our partner school VAAO. At 11 am we had lunch which was quite unusual for us because it is kind of early for German conditions. In the afternoon there were two more presentations about working conditions and the differences between German and Finnish culture which were very interesting. A nice change after the presentations was the chance to get to know the local football club called HAKA FC. The team also invited us to a match of his team in the evening. So, some of us visited the Football match there. On Wednesday at 9 am we did our presentations about German school system and working conditions to the Finns. After lunch the project started and all the Germans and Finnish students worked together quite well. Of course there have been some language problems in the beginning but after a few hours it started to work very well. So we have been half an hour late for our match of frisbee golf which was kind of exhausting but a lot of fun as well! When our match ended at 5 pm we just talked a little bit about the project at the bus and enjoyed our free time at the campsite. Trip to Helsinki: One big event was our trip to the capital of Finland on Thursday. We all (Finns and Germans) started our way to Helsinki at 8 am and it took us two hours until we arrived. At the bus there was a big discussion about the topics we had to get into the APP. When we arrived in Helsinki at first we went to see the "Temppeliaukio" church which was a huge tourist attraction. The church ist very different to "normal" churches because it just looked like a big hole in the rocks. After that we went to another church called "Uspenski Cathedral" which belongs to the Finish orthodox religion. Our last attraction before we could explore the city in little groups of six was "Helsinki Cathedral" which ist called "Helsingin Tuomiokirkko". After that we split up our group to see the city and we also found some examples for some good city sights to visit. As it is usual for Finish people we had a lot of coffee breaks during the whole day. At 6 pm we just got back to our bus and ended the day with some conversations about the beautiful sights and impressions we`ve got from Helsinki. The day after our trip to Helsinki we went on with our project work at school. Everybody in the group was working quite hard to get together the approved content for the APP. At the end of our day at school some students who have already done such kind of project told us about their experience they made a couple of years ago. Their reports have been very interesting because their experiences about working in a Finish/German group were quite similar to what we have experienced so far. After school we`ve all been very exhausted so we were all kind of happy that there wasn`t any programme in the afternoon that day. Just when we had dinner there came a few of the Finish students to our campsite and we ended that day of hard working by starting into the weekend with a little Finish-German party. On Saturday, 23th of September, we started our trip to the wonderful city of Tampere. At first, we went to the interesting Kaleva church. Next was the Näsinneula Tower where we enjoyed the beautiful view of Tampere. We also ate the traditional munkki and a coffee. Really yummy! After this little coffee break at the Pynnikki observation tower we jumped in the bus and ate lunch at the restaurant. Then we had a litte bit of time for ourselves and some of us went to different museums in Tampere like the spy museum. And in the end of the day, as the big highlight, we watched the icehockey game of the teams Tappara vs. Sport. On Sunday everybody was kind of exhausted due to a week full of events. So we were all very thankful about just doing a little boat trip at 12 am. That trip was quite amazing because the sun came out and we had a wonderfull view over the lake and all the little islands in the middle of it. Except of having a Chinese dinner our teachers invited us to at 5 pm the rest of day was free. Some of the students decided to visit the museum "Mobilia" in Kangasala which is all about Finish car history and Finish rally cars and drivers. If you are interested in cars and you have the chance to come to Finland you should defenitely visit this museum because it has some very nice exhibitions. We started the second week with continuing our project work at VAAO on Monday morning. The work went on very well because the language problems we had in the beginning weren`t existing anymore. But the day at school was exhausting because everybody was working quite hard to finish their contents and put them all together into the APP. Trip to Tallinn: Very early in the morning at 5 am on Tuesday morning we started our 4 hours trip to Tallinn. First by bus to Helsinki and then from Helsinki to Tallinn by the ferry. 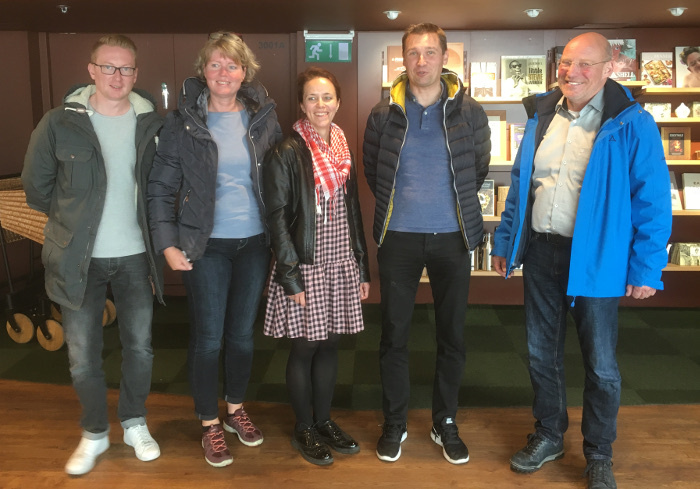 The aim of the trip was to meet some representatives from the Tallinn "Rakvere Ametikool" school to find out what their international projects are like and to give them informations about our project work. When the meeting came to an end we had the chance to explore the beautifull old city of Tallinn which is quite amazing to see. In the evening on our way back home we just made some plans for the next day at school to finish our project.